Using wood panel fronts to hide appliances is a hot trend, as shown in this Barrington kitchen that was recently updated by designer Linda Goad Larisch of Insignia in Barrington. Looking for a few ideas to update the look and feel of your kitchen? There are plenty of ways to improve the form, function and style of your space for years to come. Northwest Quarterly Magazine recently sat down with three of the area’s top designers to get their take on local trends. In many cases, today’s kitchen reflects a much cleaner and neater look than in the past. Appliances like drawer-style refrigerators, ovens, microwaves and dishwashers that are fronted to match cabinetry are what homeowners desire the most. Other trends include using LED lighting, installing soft-close drawer systems and updating the classic all-white kitchen to make it, well, less white. Great kitchens don’t come cheap. A high-end renovation can cost from $30,000 to six figures. “When it comes to design trends, folks care a great deal about their investment,” says Alan Zielinski, CKD, president of Better Kitchens, 7640 N. Milwaukee Ave., Niles. Zielinski is also president of the National Kitchen & Bath Association. “The primary focus is on trends that will make the feel of their space timeless,” he says. Here are a few ideas to consider when tackling your next kitchen project. Experts agree the kitchen is the room that should be the most green, both for efficiency and the well-being of your household. Larisch suggests searching for cabinetry that is green certified, or that is manufactured within 500 miles of your home. Some cabinet companies use unfinished lumber byproducts as a fuel source for heating homes, or they take part in a green demolition program, which dismantles buildings so that elements including cabinets, appliances and countertops can be recycled or reused, rather than tossed into landfills. You remember the all-white kitchen of the 1990s: white cabinets, floors, countertops and backsplash to match. The idea was that white would make the kitchen seem larger. The difference, now, is the use of color. Wood and tile accents break up the monotony. Bursts of color in backsplashes or chandeliers serve the same purpose. A popular trend these days is to open up the kitchen by adding or exposing ceiling beams. Depending on the ceiling height, beams can create a beautiful and fresh look. Who likes standing on a cold kitchen floor during fall and winter months? That’s where radiant heated flooring comes in. These heating systems can fit under almost any surface, from hardwood, carpet or laminate to stone, tile or concrete. The best time to install radiant floor heating is during the remodeling of your new kitchen. The digital thermostat allows you to set times for the floor heat to go on and off, so you can wake up to a preheated floor. The radiant heating system’s electronic floor mat is installed between the subfloor and the finished floor. The heat radiates off the floor, working as an efficient heat source for any room. Larisch says the dollars you save on your gas bill and the comfort on bare feet more than justify adding this project into your next remodel. Lighting is no longer a problem in most kitchens. LEDs, or light-emitting diodes, are energy-saving light sources that can last up to 20 years and be used for task lighting, general room lighting and accent lighting. LEDs are best suited for under-cabinet lighting, and showcasing collectibles or dishes. Pendant lights also are popular in kitchens, especially over islands and peninsulas. 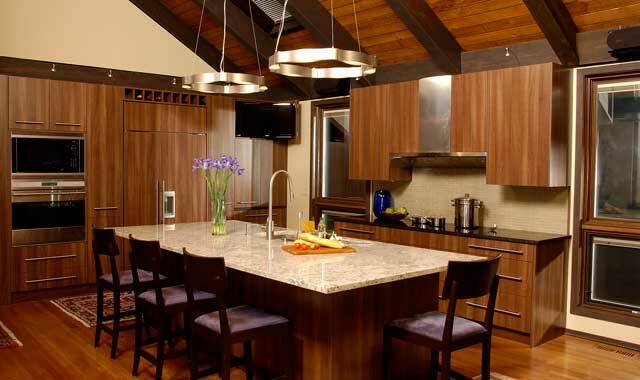 Suspended lighting over islands creates a visual break and a focal point on countertops and dining surfaces. Eyeball lights can be mounted along the edge of the ceiling over the work areas, to shed light toward the cooking and cleanup areas. 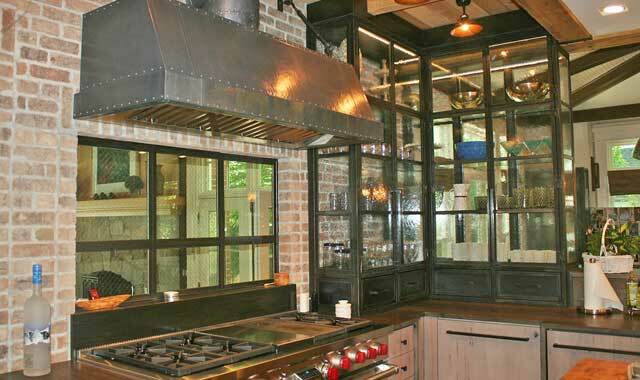 Industrial-style kitchens are often found in city lofts and other living spaces once used in industries. These spaces incorporate exposed beams, brick and pipes, even metal accents on chairs, that create a unique backdrop. The industrial look can be used anywhere, depending on how you pull it together. Tired of looking at your refrigerator or dishwasher all day long? Homeowners can cover their appliances with wood panel door fronts to match the kitchen cabinets. They provide a consistent look to a kitchen décor and can conceal appliances of different brands, colors and ages. Depending on the manufacturer, wood panel door fronts can be custom-made to fit over various types of appliances. “Though stainless appliances are still selling strong and add a more industrial look to a kitchen, having matching panels to refrigerators, wine coolers, ice makers, dishwashers and warming drawers adds an element of sophistication, regardless of the style of your kitchen,” says Larisch. Panels can be tailored to accommodate the size and dimensions of most refrigerator and dishwasher brands, so that they blend in with the rest of the kitchen. Glass tile has become a popular material used on backsplashes for several reasons. In fact, more than half of kitchen designers are using a glass backsplash material today, says Zielinski. “From a year ago, the number rose from 41 percent to 52 percent,” he says. Say goodbye to the days of having either a stained-wood or painted kitchen in your home. There are other materials that can give cabinetry an entirely different look and feel. What never changes is the box, says Holtz.Beyond that, you can do anything with a cabinet. This entry was posted on Wednesday, June 27th, 2012 at 12:00 pm	and is filed under Home & Garden, Top Posts. You can follow any responses to this entry through the RSS 2.0 feed. Both comments and pings are currently closed.